at Richard Paul Russell Ltd the very popular discount on the Complete Kestrel Weather Meter package has continued with the New Kestrel 5000 and Kestrel 5500. The Kestrel Weather Stations give a 12.5% and 10% discount over buying the parts individually. 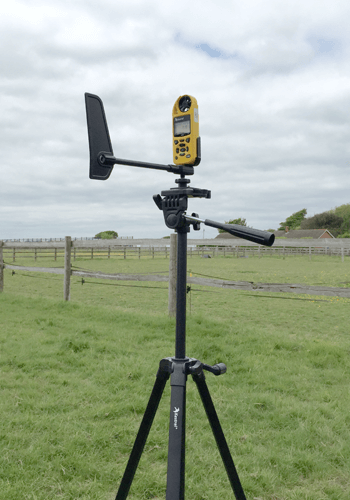 The Kestrel 5000 and Kestrel 5500 Weather Station combine the weather meter with the Kestrel Vane Mount and Large Tripod to create a complete standalone weather station. These complete weather stations can be left remotely with no human involvement to continuously log the incoming data which can be downloaded using the USB Data Transfer Interface or with the excellent LiNK (Bluetooth Low Energy) option, automatically to your Android or iOS Phone, Tablet or Laptop. These packages offer the ultimate in fast, accurate and flexible weather data collection at an affordable price. Some interesting reading from the NK Blog…. Measure air velocity and write it down. Calculate cross-sectional area using π(r)2 for circular ducts or x(y) for rectangular ducts. Measure duct dimensions and enter them into the Kestrel. Hold the Kestrel to the duct opening to directly measure air flow. The Kestrel 5200 simplifies the process and eliminates the potential for human error when making the various calculations used to determine Volume Air Flow. Not only that, the Kestrel also measures temperature, humidity, and moisture content in air, so you can determine dehumidification needs and the overall comfort level of the home.